War is in Brian Turner's blood. His father served during the Cold War, his uncle fought in Vietnam, his grandfather fought in World War II and his great-grandfather in World War I. And the family's warrior tendencies went beyond deployments: Turner's dad built a martial arts studio in the garage, and the family mixed napalm and blew things up for fun. Turner himself, whose Army deployments included tours in Bosnia-Herzegovina and in Iraq, is a poet as well as a soldier. His work includes the award-winning piece "The Hurt Locker," inspired by his service in Iraq. 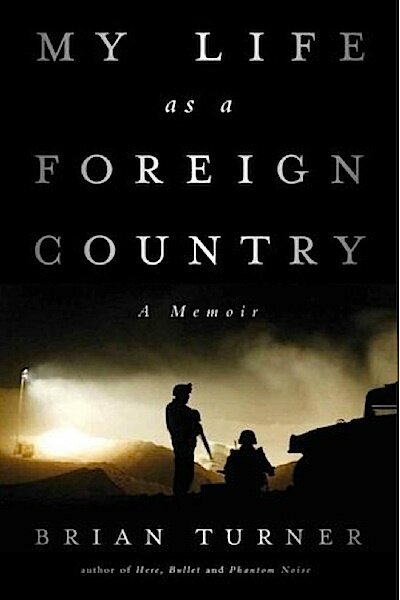 In his memoir, My Life as a Foreign Country, the poet turns to prose, using fragmented, lyrical language to explore his inheritance of war and what it means to be a soldier today. Turner tells NPR's Arun Rath that his squad leader once said, " 'Men, we're in the job of hunting for people's souls.' "
The poet adds, "Of course, the contract that goes with that is that others will hunt for our own." Inspired by that reciprocal relationship, Turner offers readers a window into not only his family's experience of war, but also the imagined perspectives of bystanders and enemies: bomb-makers in Iraq, families caught in the crossfire, the kamikaze pilots who fought his grandfather. One perspective that is missing, Turner says, is that of the women in his family. "They're connected to this conversation just as deeply, but this particular book, I really try to follow one vein ... masculinity in war, the development of myself as a man," he tells Rath. "But I think there's probably another book in the future that will look to the other side of the house, and learn a great deal." It's something that I'm still grappling with and I'm not quite yet able to answer. And the book itself led me into other questions that were unexpected. In the very moment when bullets are in the air ... it's more primal and much more dependent on fear. ... But outside of those moments, the vast majority of the experience that I had — when I was in Iraq, for example, I would often wonder about the people who had shot at us the day before, the people whose houses we were about to raid that night. One of them could take my life. Or there's a chance I could take theirs. And I wanted to understand them. There'd be two things. The first and most fundamental would be, do you want to live a life in which you have taken part in taking someone's soul? Taking the last breath of their life and placing the dirt over their grave? Can you walk into the rest of the days of your life with that weight? The other thing I would say is, encourage them to go to a foreign country and live in a foreign country for a year ... to be able to look back from another part of the globe and see America with a certain remove. And maybe see its place in the world. I think they'd be much richer in their lives for that experience, for one. And then the second part of that is, if they still want to join the military, then I know they're fully committed to this idea and that they'll be better soldiers for it. War and poetry may be equally ancient. Some of the earliest known poems celebrate and lament organized killing. America's recent wars have created a new generation of war poets, none more distinguished than Brian Turner. In poems about his experiences in Iraq, like "The Hurt Locker," "R and R" and "What Every Soldier Should Know," he spoke for a lot of young people trying to make sense of what they saw and felt. Turner's latest book is prose, but it certainly reads like poetry. "My Life As A Foreign Country" is a memoir in which Turner reveals how war, once experienced, becomes a permanent part of who you are. BRIAN TURNER: Mosul is inside me - all of its buildings, all of its smoke and pollution, its 1.7 million people, the university district and the bridges over the winding river, barbershops and ice trucks and sheep grazing in the ruins of Nineveh, minarets, water buffalo in the eucalyptus groves, where the rotting uniforms of Saddam's military continue to disappear, the dead Canadians out by the television station, the Kurdish Peshmerga standing guard behind sandbagged machine-gun emplacements, stationed around their regional political office, old men staring from the automotive shops, the birdlike bodies of their grandchildren chasing after us through the neighborhoods, the ghosts rising from the mist along the river, the slow-moving ghosts in the streets and alleys of Mosul, the many ghosts returning to their homes each night to sleep with the ones they love. RATH: Brian Turner comes from a long line of warriors. His father served during the Cold War. His uncle fought in Vietnam - his grandfather, in the Second World War - his great great-grandfather in the First. I asked him why he struggles with answering the simple question, why did you enlist? TURNER: For years, people asked me after poetry readings, for example, why did I join the Army? And I would give them a shorthand, which was that I come from a long military tradition. But I realized that there are layers and levels within that answer that I wasn't really meditated into - I didn't really have access to. So that was the prompt for writing this book. And then what I found was that it's something I'm still grappling with and I'm not quite yet able to answer. And the book itself lead me into other questions that were unexpected. RATH: You know, your dad built a martial arts studio in the garage. And you guys mixed napalm - as best as I can tell - for fun. TURNER: Well, we would wait for - we lived in Central Valley, California. And it's near cattle range land and great vineyards. And on foggy days in the winter, it was perfect. We would go out there. And no one could see us. My dad made an igniter. And we had a proper, you know, distance away from it, we thought. And for a boy, it was kind of perfect. But now looking back on it, it does seem pretty bizarre to think we were making napalm and blowing things up in the backyard. RATH: One of the things that's very - so fascinating in this book is the way that your experience of war connects you with your family - your father, your uncle, your grandfather, even your great-grandfather's experiences. TURNER: Yeah. I wish the women in my life - my mother, my grandmother - you know, in my family - they're connected to this conversation just as deeply. But this particular book, I really tried to follow one vein and try to see the - see masculinity in war and the development of myself as a man. But I think there's probably another book in the future that will look to the other side of the house and learn a great deal. RATH: You write with this deep awareness of multiple perspectives on war. I mean, your writing in this book, at times, from the point-of-view of families caught in the crossfire, bomb-makers in Iraq, as well as the kamikaze pilots who fought your grandfather. And it just seems strange. Because I always thought one of the things about war is that if you're fighting - if you're a warrior, you can't think of your enemy as having an identity in that way. TURNER: In the very moment when bullets are in the air - that kind of thing - you're right. I mean, it's more primal and much more dependent on fear. And people say training - for me, it was just fear. (Laughter). And - but outside of those moments, the vast majority of the experience that I had when I was in Iraq, for example, I would often wonder about the people who had shot at us prior - maybe the day before - the people whose houses we were about to raid that night. One of them could take me life. Or there's a chance I could take theirs. And I wanted - I wanted to understand them. RATH: And when you're under mortar fire, you write this phrase someone is hunting for your soul. Soul is actually a word that pops up in this book a lot. TURNER: Yeah. It's something my squad leader said to me one time. You know, men, we're in the job of hunting for people's souls. And of course, the contract that goes with that is that others will hunt for our own. RATH: Flipping back and forth in time in this book - it feels like, to me, it's more than just a narrative device - that there's - it's a way in which these experiences really stay with you and pervade your life, you know, years later. TURNER: Part of me hopes that through some of these moments, they might be completed in the reader in a way that the war might come home. And I know that's very difficult. You know, I don't want to sort of inflict pain or indict, you know, the citizens around me. But this is a part of our time. And I want to be in a dialogue with people about it. RATH: Imagine you have a grandson, and, you know, he was thinking about joining the infantry, taking on part of the family tradition. Is there something that you would say to him that you wish that your grandfather had said to you? TURNER: There'd be two things. The first and most fundamental would be, do you want to live a life in which you have taken part in taking someone's soul - taking the last breath of their life and placing the dirt over their grave? Can you walk into the rest of the days of your life with that weight? The other thing I would say is - encourage them to go to a foreign country and live in a foreign country for a year to experience the space itself, but also to be able to look back from another part of the globe and see America with a certain remove and see - maybe see its place in the world. I think they'd be much richer in their lives for that experience, for one. And the second part of that is that if they still want to join the military, then they know they're fully committed to this idea and that they'll be better soldiers for it. RATH: Brian Turner is best known as a poet. And his new memoir is called "My Life As A Foreign Country." Brian, thank you so much. TURNER: It's an honor. Thank you.